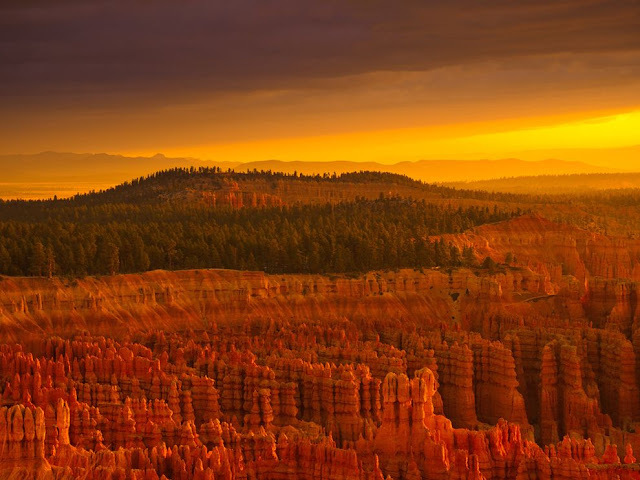 Bryce Canyon National Park ( /ˈbraɪs/) is a national park located in southwestern Utah in the United States. The major feature of the park is Bryce Canyon which, despite its name, is not a canyon but a collection of giant natural amphitheaters along the eastern side of the Paunsaugunt Plateau. Bryce is distinctive due to geological structures called hoodoos, formed by frost weathering and stream erosion of the river and lake bed sedimentary rocks. The red, orange, and white colors of the rocks provide spectacular views for park visitors. Bryce sits at a much higher elevation than nearby Zion National Park. The rim at Bryce varies from 8,000 to 9,000 feet (2,400 to 2,700 m). The Bryce Canyon area was settled by Mormon pioneers in the 1850s and was named after Ebenezer Bryce, who homesteaded in the area in 1874. The area around Bryce Canyon became a U.S. National Monument in 1923 and was designated as a national park in 1928. The park covers 35,835 acres (55.99 sq mi; 145.02 km2) and receives relatively few visitors compared to Zion National Park and the Grand Canyon, largely due to its remote location. Zion Canyon lies at the heart of this beautiful national park and is arguably the most popular of all of Utah's natural wonders. The canyon was carved by the powerful waters of the Virgin River and then widened, sculpted, and reshaped by wind, rain, and ice. Bryce Canyon is not a canyon. It is the spectacular edge of the Paunsaugunt Plateau, a place where intricately carved towers and archways of stone shimmer in a dazzling array of colour under the bright sun. Bryce Canyon National Park is considered by many visitors to be one of America's most beautiful natural treasures.